"Darwin - the evolving Bantam"
went and bought me another Bantam. Maybe it's some kind of early childhood regression - or the futile attempt to re-capture my misspent youth - anyway, whatever it was, on January 22nd, 2012, DOT and myself took a trip down to Sutton Courtenay and returned with the "Iron Chicken". Just for good measure we stopped off at Winston Churchill's place for a quick photo shoot. I dare say this bike, like most of the others I've owned, will slowly evolve until it ends up just how I like 'em. Time will tell. "Darwin" - the evolving Bantam. Right – here we go. 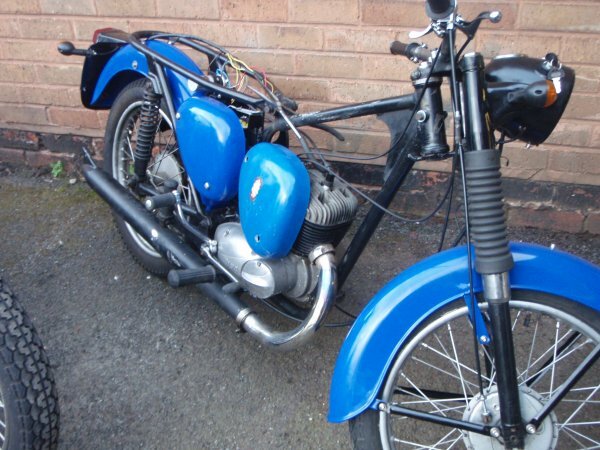 The idea was once I'd got my Bantam, I'd check the engine over, running-wise. 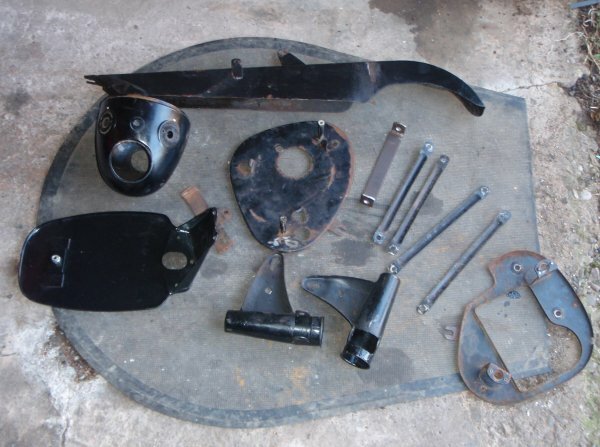 Once that was sorted, then I'll move on to cosmetics – starting with the "tinware", before spending a lot of money on wheel rebuilds and new exhausts . . . . . First thing I noticed was a loud rattle, which I took to be small end bearing. As it turned out, I was correct. So the top end came off. One new small end later, and away I went. Next thing was the kick start. 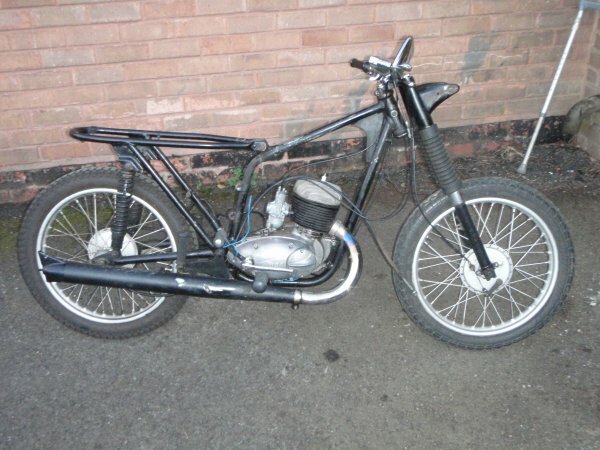 Nothing wrong with the one fitted, but I've got a thing about folding kick starts. I would rather have one that sits out of the way, rather than hit the back of your leg should something go wrong in a SMIDSY sort of a way. Despite a few "manufacturing errors" the kick start got fitted. The next most important thing ( to me ) was a reserve petrol tap. 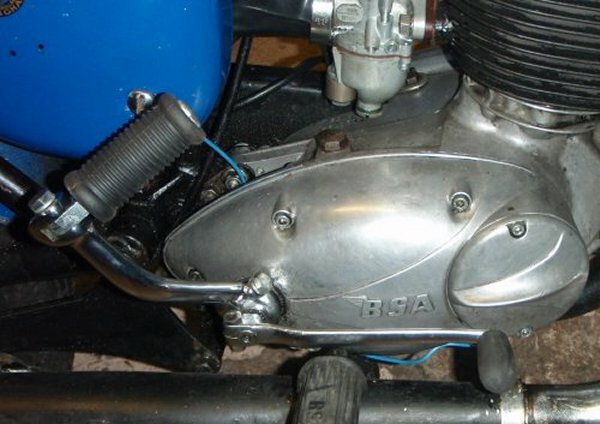 With a bit of nifty file work, I modified a tap rescued from a Royal Enfield Constellation and promptly fitted it to the Bantam. Now I could take the bike on longer runs without the fear of running out of petrol. OK – so the engine does what I want it to do. Time to make the bike look a little prettier. First of all – get the bike naked. And another pile for parts to be coated . . . I dunno . . . maybe blue . . . maybe another colour. I suppose it depends on how I feel on the day. 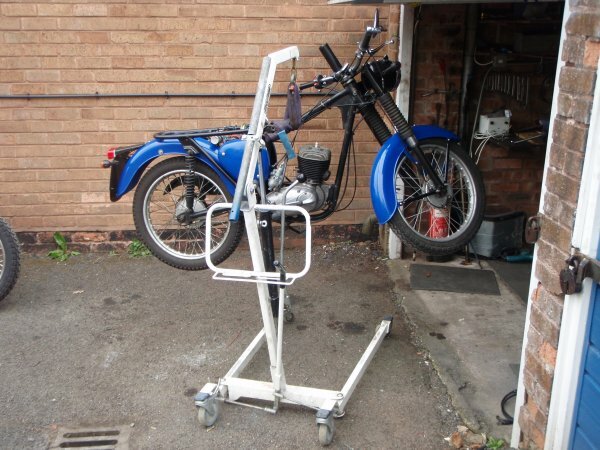 Now having removed the headlight mounting brackets, I had to re-fit the fork legs in order to move the bike around. Time to make one of those wonderful special tools. 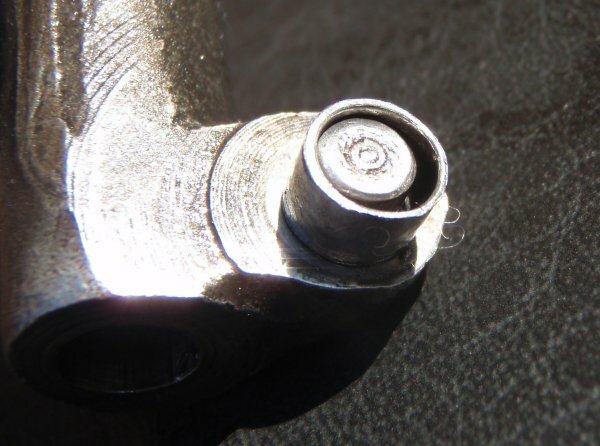 Seeing as I'd bought two new fork top nuts, I took one of the old nuts and drilled a hole through the centre, then tapped the hole to take a hefty piece of all-thread. 12mm in this case. 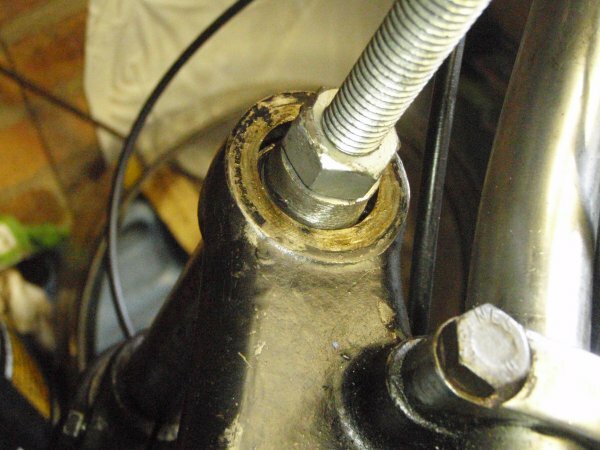 All you do now, is bung your brand new "nut on a stick" through the hole in the top yoke, screw it into the fork leg, then simply pull the leg up into the tapered hole. 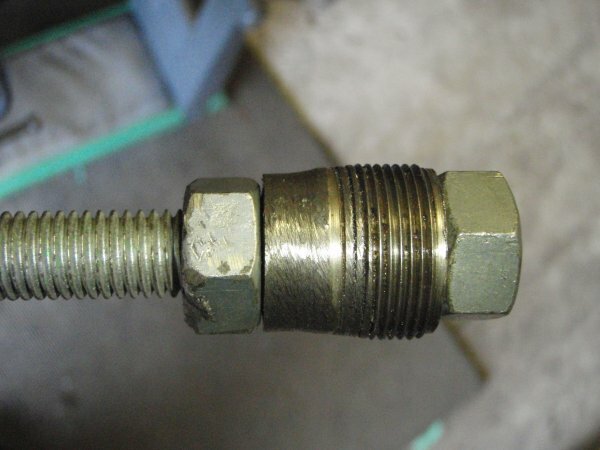 Insert the pinch bolt, remove your nut on a stick and screw in the correct top nut. That takes me up to the end of February. Next month's exciting tale should involve pretty coloured parts, new electric items and a few more miles on the clock………………..watch this space. Right, that’s another month passed. The Bantam is now rewired and running a 12 volt system. A nice little touch is the charge warning light. The light comes on should the battery not be charging. 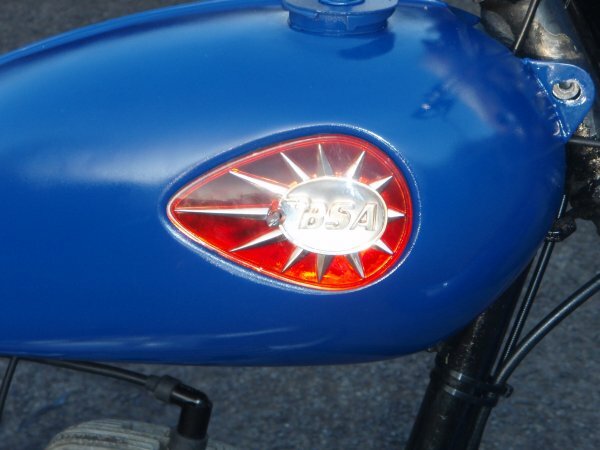 As you can see, the bike has also grown a set of indicators, along with a toggle switch for the headlight and a keyed ignition switch. The “tinware” has been powder coated. It ain’t the original colour, but it looks pretty non the less. The petrol tank was a different matter. 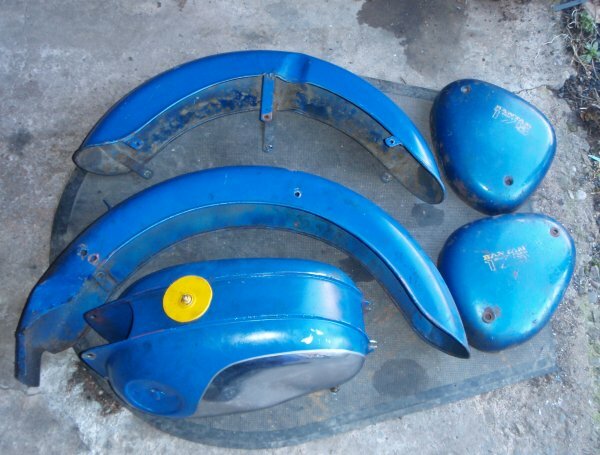 The original “Jelly mould” tank turned out to be full of body filler so was unable to be powder coated. 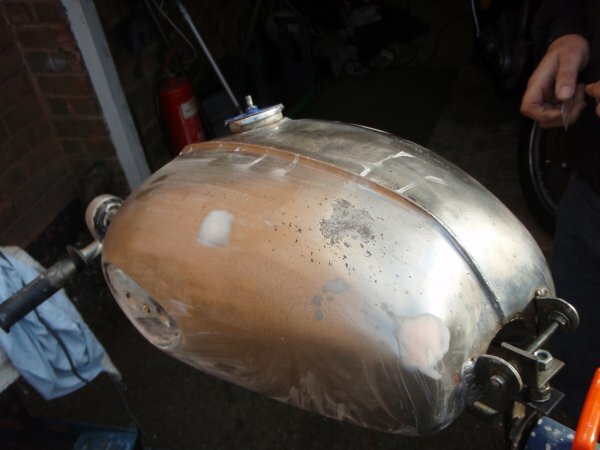 Luckily I had bought a D7 style tank from one of the Bantam Club members, so it was time to remove what was left of the pitted chrome, fill the small dings and dents, and set about spraying it. On the Saturday before the Wistanstow show, I changed the gearbox oil, then put the bike away ready for Sunday. Right – Sunday morning and off we go. The Bantam started up easily and with my mate following on his Triumph Trail Blazer, I set off. Oh dear. I have never seen so much smoke come out of a bike before. I could not see the vehicle behind me, it was that bad. 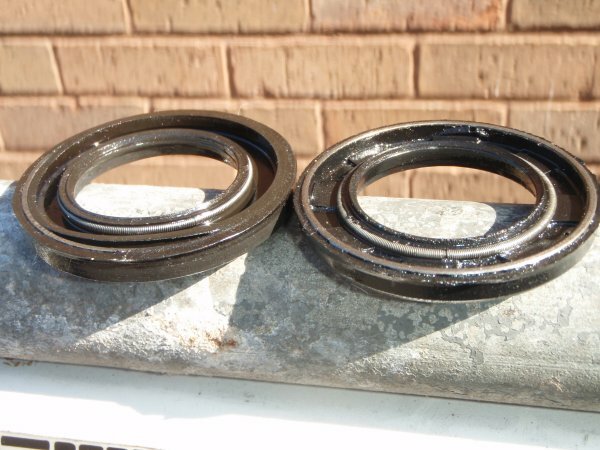 Seems the crankcase seals have gone to such an extent that the gearbox oil was feeding straight into the crankcase. I carried on, and after about thirty miles or so, most of the smoke had disappeared. The next little snag was the gearbox. After leaving the Wistanstow show, we headed for the Welsh border and I took the Bantam up to the top of the Long Mynd. The road up to the top is a nice one in four hill, so I changed down to first gear and started off. The bike constantly kept jumping out of gear – that will need looking at. Apart from those problems, the Bantam did 130 miles or more with no trouble. Time to pull the engine out. . . . . Yes – those are knackered seals. And I don’t think that gear selector roller should look like that. Time for me to buy a few new bits and pieces. I took my other BSA, a B33, over to Rex Caunt Racing and met up with Rex. What a delightful, helpful and charming fellow he is. We spent over an hour generally “talking Bantams” and drinking coffee. I left clutching new seals, new bearings, a roller for the gear selector, a new gearbox sprocket, a piston , and quite a few other odds and ends. It didn’t take long to put the engine back together – I did have a struggle getting it in the frame, but that’s due to the fact this injury prevents me from bending down. I started the engine up – hoping that great clouds of smoke would no longer issue forth. Indeed there was no smoke . . . . . but the most unholy case of piston slap you have ever heard. To cut a long story short – I had picked up a standard size piston from Rex . . . . . .my Bantam was +020” over. Nothing that a piston of the correct size couldn’t cure. One piston later and I took the bike out for a run. No excess smoke, no piston slap, but that jumping out of first gear when under extreme load is still there. . . . . . . . but that’s a problem to be sorted out in the future . . . . . let’s see what next month brings, eh ? Here we are, another month down the line. I still had the problem of the bike misbehaving under load in first gear. First thing - get the engine back out. This is normally an easy job, but when you are unable to bend or kneel down, it becomes a tad more tricky. If I can't reach down to the engine bolts, then the engine bolts will have to come up to my level. 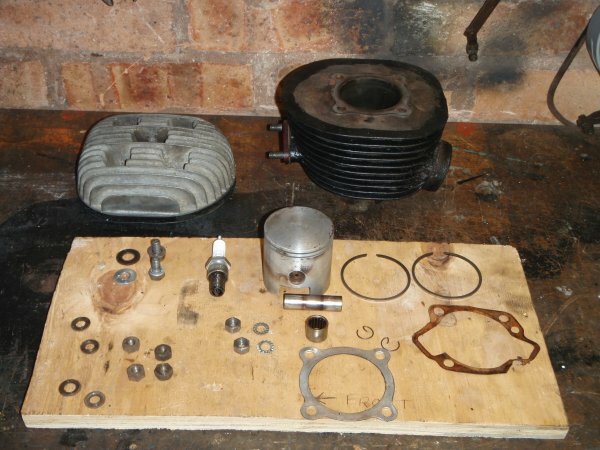 As it happened, the engine had to come apart anyway - when I built it last time, I was distracted by a visitor to the garage, and by the time I actually got as far as joining the crankcases together the sealing compound had already set . . . which meant the engine was losing oil through a poor joint. When I split the engine again, the first thing I spotted was a small steel roller. This was the roller from the gear selector fork - the selector which is responsible for engaging first gear. 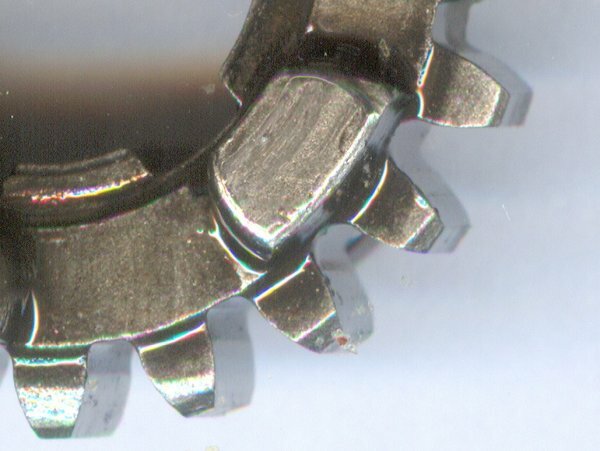 No wonder it was dropping out of gear - it wasn't fully engaging. 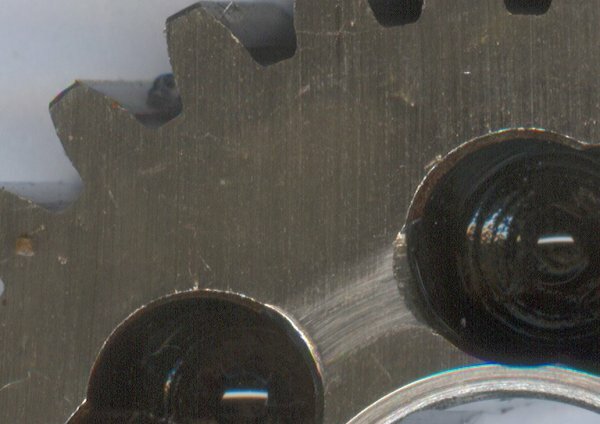 I took the two gears responsible for first and scanned 'em at high resolution - I find this is a much easier way to take a real good look at 'em. They didn't seem too badly worn, so they went back in. This time I made sure the selector fork roller was held in place with a big blob of grease. 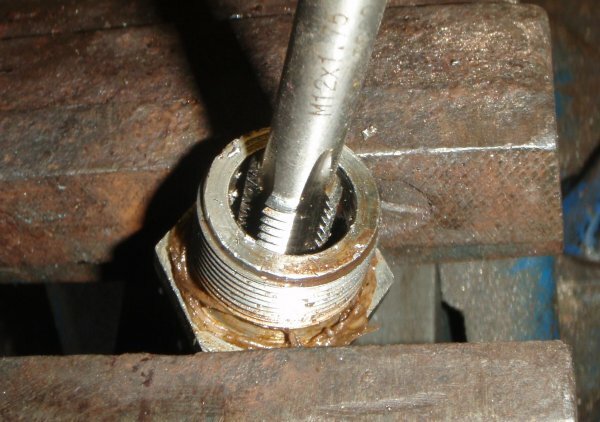 I decided to make up a tool to hold the clutch centre whilst undoing the securing nut. 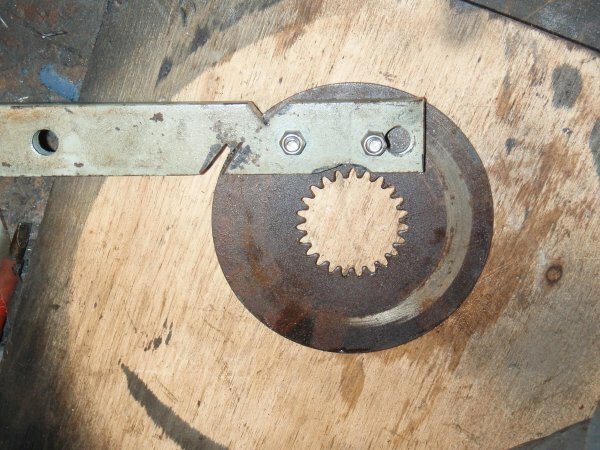 This is easy enough to make - all you need is an old friction plate, a length of steel strip and a couple of nuts and bolts. 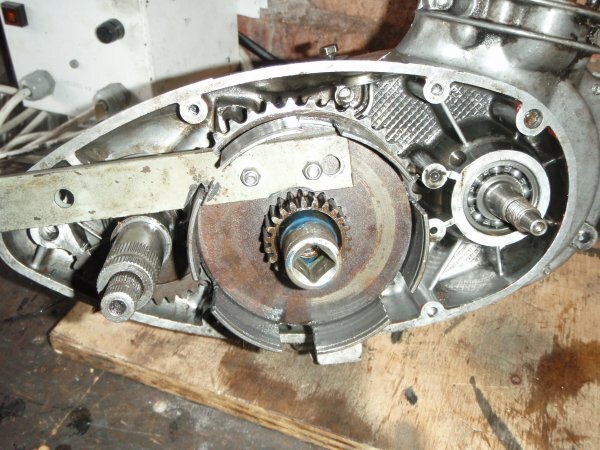 It's simply a case of bolting the old clutch plate to the steel strip and then cutting a few slots in the steel strip to allow it to clear the sides of the clutch basket. 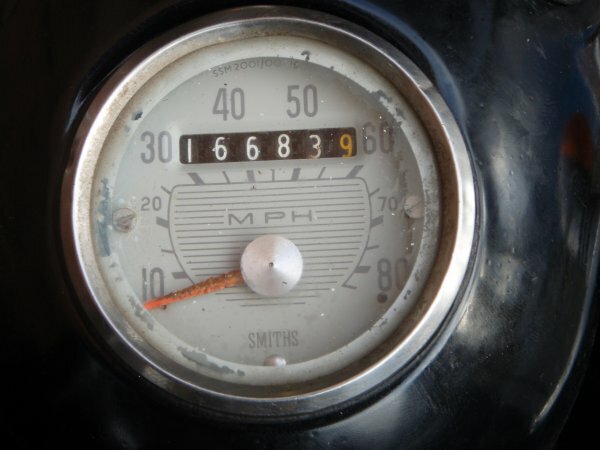 The other little niggle I had was with the speedometer. I have a pushbike "computer" speedo fitted which is quite accurate. 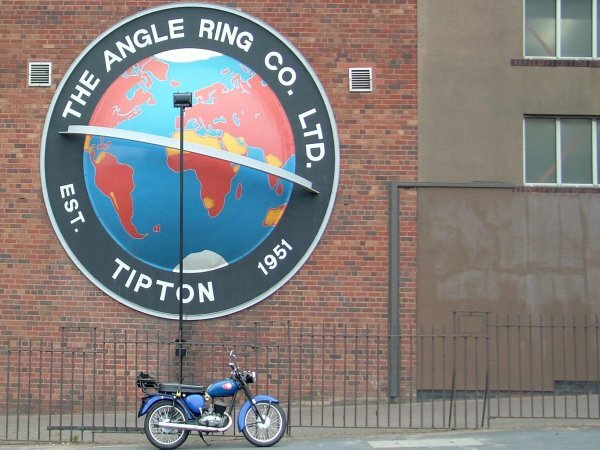 The Smiths item fitted to the bike was anything but accurate. I could quite easily get the needle hard against the stop at 85 mph . . . . .in third gear. 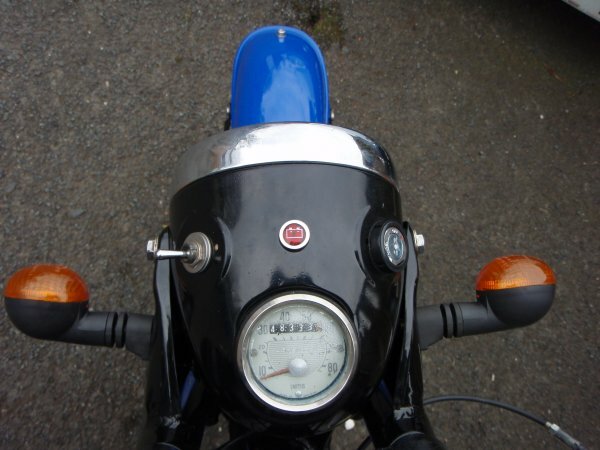 Luckily, Howard, from the Bantam Club just happened to have a spare speedometer - so following a bit of bartering at the club AGM, I became the owner of another speedo. A quick test with my electric drill seemed to confirm that this clock would be much better. My original clock would max out at around 65 with the drill running flat out - the new clock showed around 40 mph. As a bonus - my bike has now got 31870 fewer miles on the clock. Time for another test run. 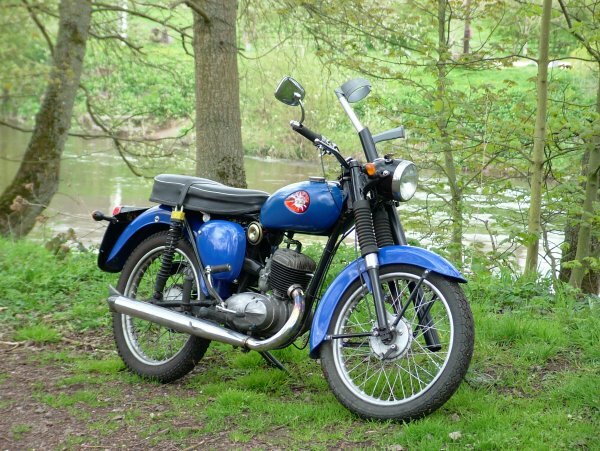 This time I took the bike on a nice eighty odd mile jaunt around the Severn Valley. This route has a few very steep climbs - the gearbox did jump out of gear once - but on the next few runs up the same hill it did what it was supposed to. The speedometer was agreeing, within a few mph, with what the cycle computer was saying. In fact, I spent a most enjoyable day riding around and taking photographs. . . . . . which is as good a way as any of spending my time. Right, that sums up April. Most nasties seem to have been cured. I suppose making the wheels look prettier will be next on the list. Do I go for new rims and a rebuild, or do I see what sort of a finish this new powder coating will give ? 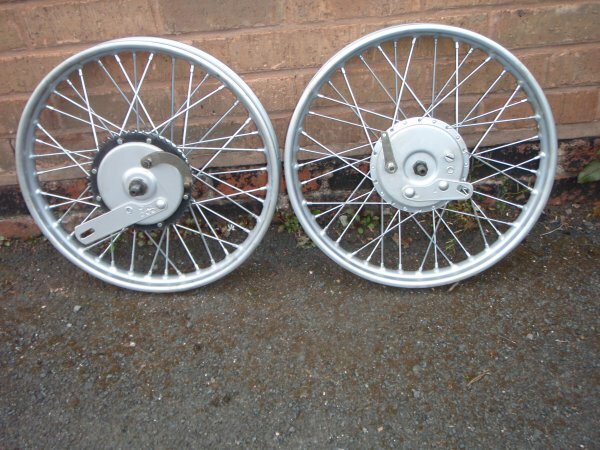 More to the point - is it worth throwing the best part of £500 on a pair of rebuilt wheels with new stainless rims and spokes on the Bantam ? Let's see what next month brings, eh ? One of the other things I was messing around with was a nickel plating kit. I had a power supply, and it didn't take much fettling around to make a current regulator. A quick look on the internet for a supplier of suitable plating chemicals and we were in business. Now plating will only ever be as good as the prior polishing - and I ain't a metal polisher. Just to see if my kit worked, I polished the brake operating arms and the chain adjusters. One hour at just over one Amp - and another hour at 200 MA gave me a rather nice finish. I've got a few refinements to make to the plating kit, but it looks like it will work just fine. Whilst taking my B33 for MOT, I happened to mention to our friendly local tester, Fred, that I was looking for a small rear carrier - the size that would look suitable for a Bantam. Would you believe it - Fred just happened to have a small Craven carrier, complete with fittings. Thanks Fred. 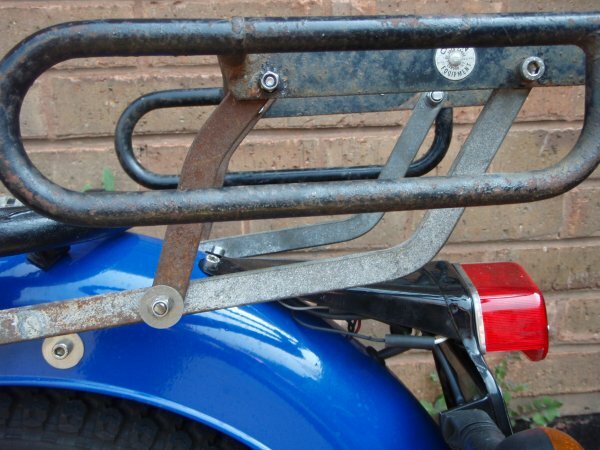 This was promptly fitted to the bike, then removed for powder coating - so now I have somewhere to carry my two stroke oil and the other essential odds and sods you need when travelling by Bantam. The only other thing on the bike which has not been "bought up to scratch" is the exhaust system. OK - the silencer was painted black when I got the bike, so I removed the paint revealing the tired looking chrome beneath. Saying that - I've seen ( and rode ) bikes with chrome in a far worse condition . . . . . do I now spend another £150 or thereabouts to make the exhaust system all shiny and new ? That would take the money spent on this bike to just over £1100 - and that doesn't count the cost of actually buying it in the first place. 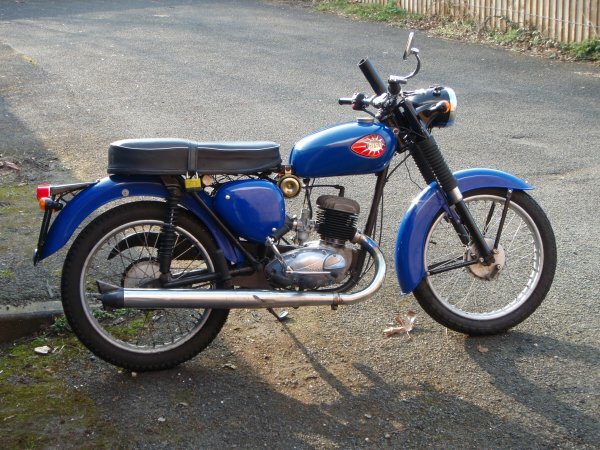 No - I reckon the Bantam now looks presentable - it's got new bearings - the paintwork is new - it's running at 12 volts - it has a nice shiny carrier .................the best thing to do is just enjoy riding it. 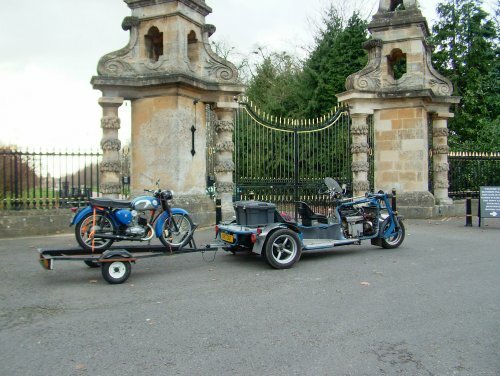 September 2012, and the Bantam takes a ride down to London . . . and a certain cafe. 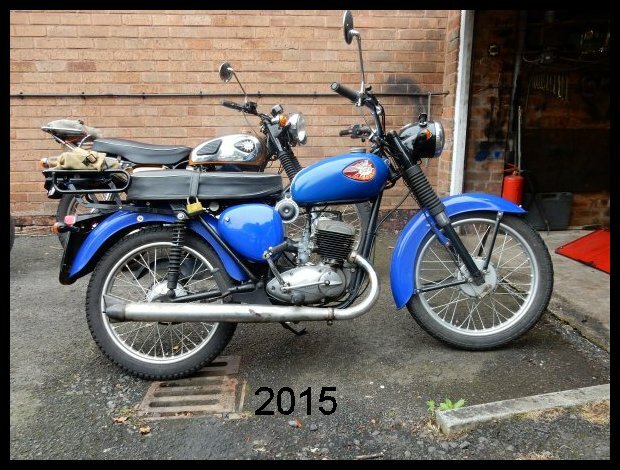 The Bantam had the honour of being the first bike I could ride following my hip replacement. Now that my left leg has a lot more movement hip-wise I found my knee was hitting the handlebars when I tried to do a "U" turn to the left. 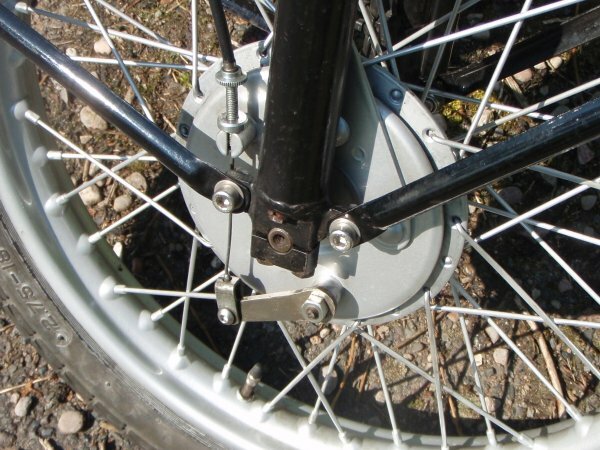 This was solved by fitting higher handlebars - which in turn meant me making up some longer cables for the clutch and front brake. The Bantam did suffer a slight "incident" where the poor little thing ended up in the rubbish bin. I forgot to fold the side stand up before rolling the Bantam on to the bike bench - the stand caught the ramp on the bench and tipped the bike sideways into my rubbish bin. The only casualties were a broken rear indicator and a small dent in the silencer. 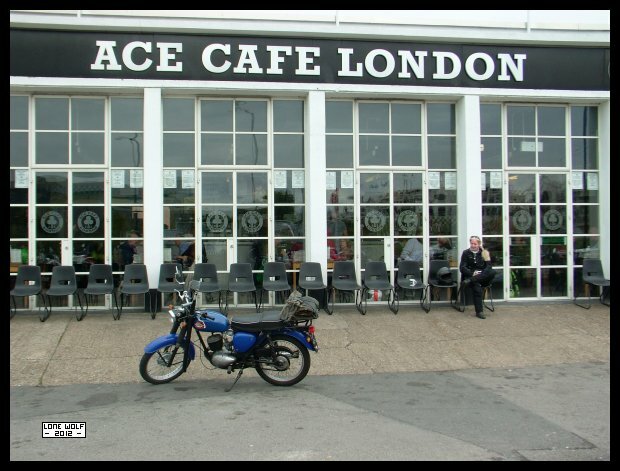 September 2013, and the Bantam sets off for the Ace Cafe in London. Everything went just as it should, and by three o'clock I'd arrived at Chris's Cafe in Stokenchurch. I dropped a few things in my room and set off back up the road for some dinner. I was happily eating away in the Studley Green garden centre when I shifted my weight and went to turn on the seat . . . oh dear, it seems my foot was trapped beneath the table leg and the only thing that could twist was my right knee . . .which it did. I found I couldn't straighten my right leg, this ended up with an ambulance ride to Stoke Mandeville hospital, followed by an arthroscopy of the right knee. 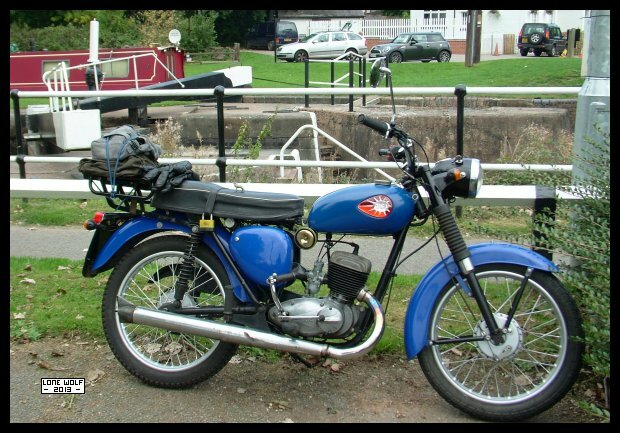 The Bantam was ridden back home on the Monday by Andy M ( thanks for that ) - I came back a day later in Ian's car ( thanks again ). . . . .at least it looks happy sitting here at Hatton Locks on the way to the Ace Cafe. It's now August 2014 and the Bantam has quietly been getting on with doing what a Bantam does best . . . taking life at a relaxed pace and generally giving no trouble. I don't know if the "Chicken Run" at the Ace Cafe is being held this year, the organizer, Howard Blakeborough ( Bournemouth Bantams ) has moved to Cornwall and so far it looks like no one has come forward to take his place. Still, there's plenty of time so it's fingers crossed. It looks like Doug Brown took on the job of sorting things out - so many thanks from this end. Once again I set off on the Bantam - this time I intended to get to the Ace and back the same day rather than staying overnight at Stokenchurch ( or Stoke Mandeville for that matter ). What can I say ? The Bantam got there and back without any trouble at all. The B175 has just got on with doing what a Bantam is supposed to do. 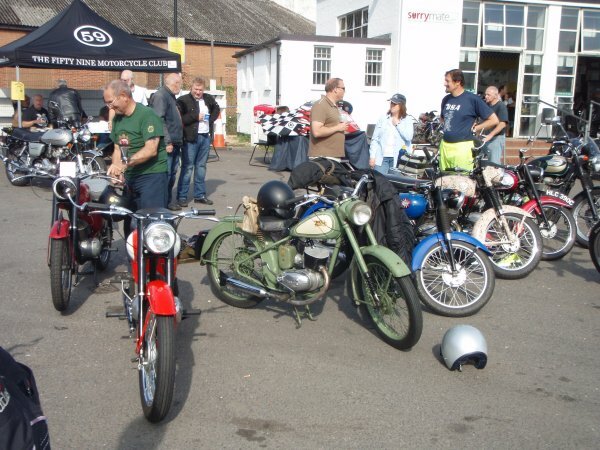 It's running well - it's been to a BSA owners club day out - all in all, it's given me no trouble at all. The B175 has just been sold. . . . Why? . . .Well I've now got the D14 Sports up and running and I don't really need two Bantams. Both of them have their good points, but the first road legal bike I had was a D14 Sports, plus that was the bike I passed my test on all those years ago. So it was purely a fondness for the Sports that meant the B175 had to go. Besides, I'd only done 44 miles on the B175 in the last twelve months.